I have an article that I want to publish on my Joomla! site. Every time I click apply or save. I get error 500 - An error has occurred! DB function reports no errors. I have no idea why this error comes up, al I can think is that it's a server error. I'm using TinyMCE to type articles together with Joomla! 1.5.11.
at the top of the index.php pages for Joomla! but it does not show any errors. I checked the error logs on the server and also no errors come up. I managed to publish the article via phpMyAdmin but then something else happens. I try to access to article from the front end, by clicking on the link to the article, but only a blank page comes up. This is really weird, since the error log does not show any information. So I assume the error needs to be coming from Joomla! I read this other question and saw that you can't post the article since it's confidential. Is it in "plain english", does it have html? Could you provide some more information? Joomla has some plugins that "filter" a lot of content. If you try to write "iframe" or "script" tags in Joomla TinyMCE it's going to be filtered, this is Joomla's way of providing security. Did you try to disable TinyMCE filters? Go to "Plugin Manager", "Editor - TinyMCE 2.0" and change "Code cleanup" options to test. Looking at your POST array, it looks like the body text of your post isn't being sent. This would suggest it's a problem on the front end. Can you check the name of the HTML element where you are typing the body text? If you could edit and show us the relevant parts of the HTML form that would help too. edit: ok, that article you linked to is almost 150,000 bytes, so it might be that it's choking on it. If this is a once-off article that you probably won't have to edit too much, I'd recommend putting in some dummy text and then going into your database using phpMyAdmin or something and editing the text in the jos_content table. The introtext and fulltext columns are defined as MEDIUMTEXT so they should be able to hold up to about 16MB without hassle. If writing and/or editing articles of this size is something you'll be doing often (and hence, don't want to go into the DB each time), then perhaps you'll have to look at the maximum post size allowed. This error could occur when you use Firefox. Try to reproduce using IE. """you can ask to your hosting provider to disable the function suhosin in php.ini. When this function is enable, is not possible to save large posts."""". datatype. Check if it works for you . Not the answer you're looking for? Browse other questions tagged php mysql joomla joomla1.5 or ask your own question. DB function reports no errors when adding new article in Joomla! 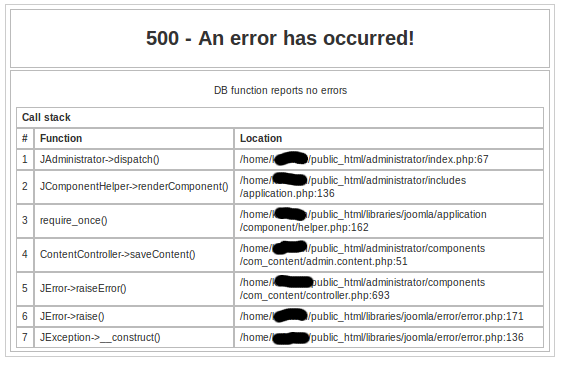 how to solve 500 Internal Server Error in joomla?